The goal is for all TKK units to gradually adopt the new content management system. 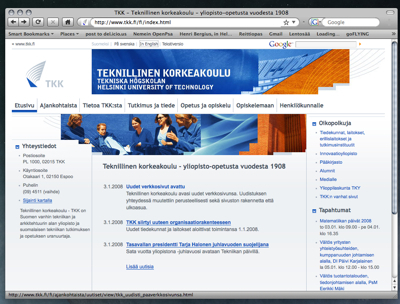 This would standardise the appearance of all TKK web pages as well as their style of presenting information. The new TKK web pages utilise an open source content management system, Midgard CMS, provided by Nemein Oy, and their appearance has been designed by Activeark Oy. Adage Oy consulted TKK on user centered design of information architecture. Quite a few interesting details on the site, like Shibboleth single sign-on and use of OpenStreetMap and Mapstraction as the official web map solution. Update: It should be noted that TKK’s Laboratory of Media Technology has been running Midgard since around 2000.